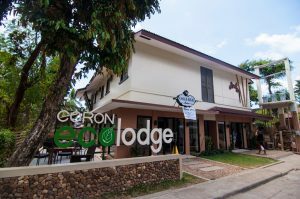 Welcome to Coron Ecolodge Hotel. This modestly designed boutique hotel located along the quiet street of Calle Real is a welcome surprise for many of its guests. give-a-light From its creamy interiors, wooden accents, a glass panelled lobby that allows the natural light to bask the interiors in a golden glow, down to the colorful wooden accents of the trademark geckos and stingrays crafted by local artisans …everything about Coron Ecolodge Hotel speaks of an attention to detail that takes their guests’ comfort and needs in mind. Everything you need in town from the local municipality, banks, laundry, bakery, a handicraft store, and even a small parlor and spa, are just a short walk away. Each of only 21 simple but well-designed 15 square meter air-conditioned rooms has 2 standard double beds, wooden clothes cabinet, Cable TV, private bath with hot and cold shower and 2 towels which are replenished daily upon guests’ request. A generator and deep well is on hand to serve as back-up 24-7. The Calle Real Bistro provides Free flowing coffee to its guests. But perhaps what makes Coron Ecolodge stand out more than anything else is the exemplary customer service. From arrival to departure, our staff eagerly and sincerely extends assistance to the guests for a myriad number of requests-from tour coordination, bookings and inquiries, planning for a special occasion (even a marriage proposal), advise on where to go or where to eat, care when you’re feeling under the weather, getting your clothes to a laundry shop, even purchasing the requisite pasalubong of lamayo for which Palawan is known for, nothing is too small to help guests with. And they do it all with a smile! Because at Coron Ecolodge…it truly is a pleasure to be of service. 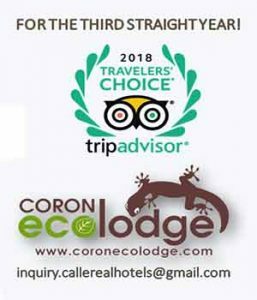 No wonder Trip Advisor ranks Coron Ecolodge best value-for-money hotel in town. For only Php 2,298 per room, per night inclusive of complimentary ala carte breakfast for 2 pax, Free flowing coffee, and service that travelers get from higher starred hotels, this package certainly offers more than what guests pay for or expect. If you have children 10 years old and below or Senior Citizens, please inquire directly for available discount. Through the years, Coron Ecolodge has proven to be a popular draw for budget yet value-conscious and savvy travelers. And the good news is, its sister establishment, Casa Coron Hotel is now open to meet the demand for quality rooms and service at an affordable price with one queen and one single bed per room. Come to Coron Ecolodge Hotel and experience what it’s like to be truly made welcome. To book: click on the tab “Reservations”. To inquire about our packages for accommodations with tours, please email us at inquiry.callerealhotels@gmail.com or text our Manila office at 63 927 077 8873 with your complete name, number of pax and target date of stay.